When your kids misbehave, how do you usually feel? Most parents report feeling angry, frustrated or embarrassed. When you're feeling like that it's easy to think of consequences that will make your children pay for their poor behavior. They won't dare do that again! When you use punishment in response to your children's misbehavior, they usually learn to avoid getting caught in the future. However, they aren't necessarily learning how to develop self-discipline and make better choices. By focusing on solutions instead of punishment, you increase the chances that it doesn't happen again - even if you're not around. Recently on the way home from a Seattle middle school, two boys got into a fight near the school bus stop. There was some pushing and shoving involved and other kids were standing around watching. During this skirmish, one boy took a video of it on his phone. When he got home, he posted the video on YouTube. After seeing the video, the school officials decided to punish all the kids in the video - those watching and those fighting - with a one day suspension. 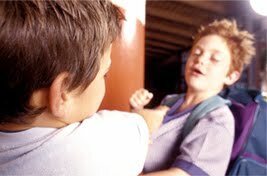 The school policy is that kids should walk away when a fight breaks out so that they don't add support to what is going on. The kids have been taught this during school assemblies. Who qualifies as a stranger to a young child?